On December 14, 1872, a strong earthquake in the Cascade Mountains caused damage at Victoria, British Columbia, and Seattle. It was felt over a very large area, about 390,000 square kilometers, extending as far south as Eugene, Oregon, and north into British Columbia, probably even into Alaska. Walls were cracked (MM VI) at Blaine from a January 11, 1909, earthquake. Also, plaster was thrown down at Bellingham and sidewalks were reported cracked and piers were damaged at Anacortes. The felt area covered approximately 65,000 square km. Another shock occurred in the same region on January 23, 1920. The epicenter was probably under the Strait of Georgia. Windows were broken and brick walls were cracked (MM VII) at Anacortes and Bellingham; there was some damage to houses on Vancouver Island, British Columbia. The crews of several vessels reported feeling the shock. On July 15, 1936, a magnitude 5 3/4 earthquake was centered near the Washington State line between Walla Walla, Washington, and Milton, Oregon. The shock was strongest at Freewater, State Line, and Umapine, Oregon (MM VII). The ground was badly cracked, and there were marked changes in the flow of well water. One concrete residence collapsed at Umapine; in addition, many walls and chimneys were cracked. At Freewater, practically all the chimneys that had been built during the last 10 years were damaged at the roof level. Concrete pavements were cracked at State Line. The most damaging effects in Washington were at Waitsburg, where several chimneys fell and plaster cracked. Total damage amounted to about $100,000. The felt area covered about 272,000 square km, including most of Washington, Oregon, and northern Idaho. Another shock of magnitude 5 3/4 originated near Olympia on November 12, 1939. A few fallen and twisted chimneys (MM VII), cracked concrete and plaster, and broken windows occurred throughout the epicentral area. The most noticeable damage was at Centralia, Elma, Oakville, and Oylmpia. Most of Washington and a portion of Oregon felt the tremor; it was also felt in some parts of British Columbia. The total U.S. area affected was about 155,000 square km. Minor damage, such as cracked plaster and chimneys (MM VI - VII), was reported from North Bend, Palmer, and Stampede Pass following an earthquake on April 29, 1945. Slight damage occurred in a number of other towns in the area and there were large rock slides on the west face of Mount Si. Many reports described moderately loud to terrific explosion-like sounds accompanying the ground shaking. This earthquake was felt over the greater portion of Washington, a small section of western Idaho, and in the vicinity of Portland, Oregon, approximately 130,000 square km. A strong aftershock caused additional slight damage at North Bend about 10 hours later; another aftershock on May 1 was widely felt. A shock, which reached a maximum intensity of VII at a number of places in the Puget Sound area was felt over about 182,000 square km, occurred on February 14, 1946. A few deaths were attributed indirectly to the shock; damage was estimated at $250,000, mostly in Seattle. Most of the reported damage was limited to cracked plaster and slight chimney failure, but there were a few cases of spectacular building damage in Seattle. The magnitude 5 3/4 tremor was also felt in southwestern British Columbia and northwestern Oregon. One of the strongest earthquakes on record for the Puget Sound area followed a few months later. A magnitude 7.3 shock in the Strait of Georgia on June 23, 1946, caused the bottom of Deep Bay to sink between 2.7 and 25.6 meters. These measurements were reported by the Canadian Hydrographic Department. Also, a 3 meter ground shift occurred on Read Island. One person was drowned when a small boat was overturned by waves created by a nearby landslide. Waves were reported sweeping in from the sea, flooding fields and highways. Heavy damage occurred in the epicentral region. South of the Washington State boundary, some chimneys fell at Eastsound and on Orcas Island and a concrete mill was damaged at Port Angeles. Some damage occurred on upper floors of tall buildings in Seattle. The shock was strongly felt at Bellingham, Olympia, Raymond, and Tacoma. The total affected area in Canada and the United States was about 260,000 square km. 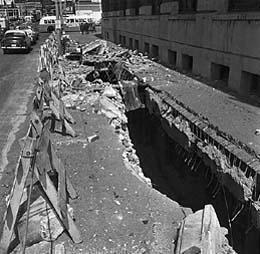 Property damage estimated at upwards of $25 million resulted from a magnitude 7.0 earthquake near Olympia on April 13, 1949. Eight deaths were caused either directly or indirectly, and many were injured. At Olympia, nearly all large buildings were damaged, and water and gas mains were broken. 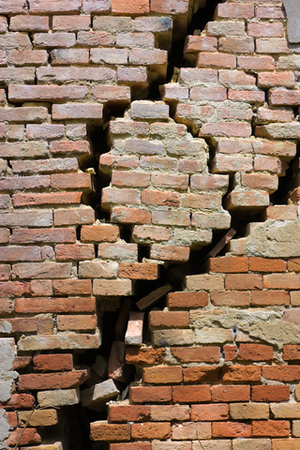 Heavy property damage was caused by falling parapet walls, toppled chimneys, and cracked walls (MM VIII). Electric and telegraphic services were interrupted. Railroad service into Olympia was suspended for several days; railroad bridges south of Tacoma were thrown out of line, delaying traffic for several hours. A large portion of a sandy spit jutting into Puget Sound north of Olympia disappeared during the earthquake. Near Tacoma, a tremendous rockslide involving an 0.8 km section of a 90 meter cliff toppled into Puget Sound. The felt area extended eastward to western Montana and southward to Cape Blanco, Oregon, covering about 400,000 square km in the United States. A large portion of western Canada also experienced the shock. On November 5, 1962, a moderately strong earthquake caused minor damage in the Vancouver, Washington - Portland, Oregon, area. Numerous chimneys were cracked or shaken down (MM VII) in Portland. Several buildings had tile ceilings fall, and other damage such as cracked plaster and broken windows were reported. Slight damage was reported from several towns in Washington. The tremor was felt over an area of approximately 52,000 square km of Washington and Oregon. The magnitude was measured at 4 3/4. 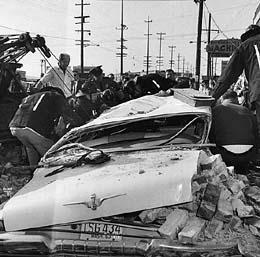 A magnitude 6.5 shock on April 29, 1965, which was centered very close to the epicenter of the 1949 earthquake, caused about $12.5 million damage. Three persons were killed by falling debris, and the deaths of four elderly women from heart failure were attributed to the earthquake. There were numerous injuries, but most were minor. The shock was characterized by a relatively large intensity VII area and small pockets of intensity VIII damage in Seattle and Issaquah. Extensive damage to chimneys was noted in West Seattle. In 188 city blocks, it was found that 1712 of 5005 chimneys were damaged. Two schools in West Seattle and two brick school buildings in Issaquah were damaged considerably. In general, damage patterns repeated those experienced during the 1949 shock. Buildings that apparently had been damaged in 1949 often sustained additional damage in 1965. The tremor was felt over 340,000 square km of Washington, Oregon, northern Idaho, northwestern Montana, and part of British Columbia. 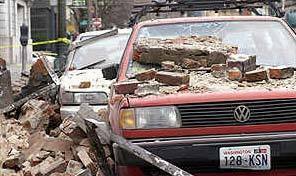 A magnitude 5.3 earthquake hit Seattle on May 2, 1996. Information about this earthquake is available from the Pacific Northwest Seismograph Network. Another earthquake struck Western Washington on July 2, 1999. Information about this earthquake is available from EQE, a consulting company. The most recent major earthquake, the Nisqually quake, was a magnitude 6.8 quake and struck near Olympia, WA on February 28, 2001.